It turned out the ceramic electric stovetop in my flat is to puny to boil water properly in a kettle this size. I don't know what the actual power of it is, but assuming 1.8 kW, it would barely be enough power to cover evaporation, never mind all the rest of the losses. So I found a nice 18 cm gas burner off a bloke from a local classified webpage. And once I sourced all the ingredients, the new adventure could begin. Brewing on the balcony of my flat, of course the wind was giving me trouble, but after I improvised with a baking tray and some other stuff I had lying around, I got that under control as well. After chilling the wort for about an hour in the kitchen sink, I got it down to 22 °C, poured it into the fermenter through a sieve and pitched the SAFALE-04. The taste so far was nice, altough quite bitter, but I guess that should go down a bit in the next couple of weeks. I'm attaching a picture of the boil, the only one I have of the day. Maybe I will be more diligent in this respect next time. So far I'm excited, now let's hope for the best during the next stages. Last edited by bejkee on 07 Mar 2016, 03:13, edited 1 time in total. I'm sure it will be your best ever beer. Haha, that is a given. It also appears to be fermenting, so things are definitely looking good. Nice job bejkee - congratulations . Nice save with the burner and then the wind too. Sounds like you really kept a cool head and didn't let anything throw you. Managed to squeeze out another batch this saturday. This time I adjusted the BIABacus auto-kettle efficientcy by -10%, put in a recipe for a special bitter from brewing classic styles. I'm proud to say that the OG this time was spot on. 5 litres went into the fermentor, but since I had to run off to Prague in the afternoon I attached a blow-off to this one. Hoping I don't come home to a mess on the floor. (I did put the whole setup on a baking tray just in case). Last edited by bejkee on 14 Mar 2016, 19:35, edited 1 time in total. That looks absolutely beautiful! 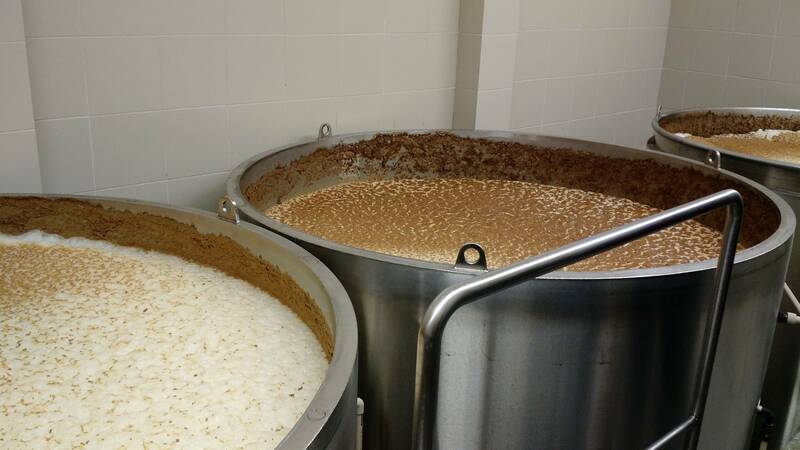 I love the sight of fermenting wort. And Czech pilsners are one of my favorite beer styles. That does it - I'm going out to the beer fridge and pouring myself a German pils... (Closest I've got right now...). Nice post. Cool deal. Let us know how it works out. Easy to make adjustments on subsequent brew sessions to make them better... But bet you find that even if not perfect, you will like the result of your first BIAB beer. Both batches turned out great! The first one is very drinkable, almost gone already, while the second, special variety also turned out ok. So with all this encouragement I went ahead and bought some new grain and hops and set out to brew my first IPA. The brew was quite eventful, with a bit of wild foam splashing over the edge of my kettle on the first hop addition. When it came time to pitch it I measured the gravity and the reading was 1.047 instead of the expected 1.062 that the recipe from Brewing classic styles was suggesting. A little bit of detective work later I realized that I forgot to change the OG in Biabacus to the correct value, so I used almost 30 % too little grain. Lol! And congrats bejkee . Your diet IPA I think will be fine. For me, at least, the APA and IPA recipes in BCS can always use more hops so the "error" might even work in your favour. I'll consider this one of "happy little accidents" in the spirit of Bob Ross. I cracked open a bottle of the diet IPA and indeed PistolPatch, it did turn out okay. Better than that, it turned out to be a great beer, wow! With the bits and pieces of malt and hops that I had lying around, it has just the right kind of balance and a nice aroma. Probably wouldn't really fit into any style or be more towards the typical pale ale territory it is nevertheless a very nice beer. Just thinking about it made my mouth water and made me crave another bottle. Damn, it looks like I'm really hooked on this homebrewing thing. That is awesome. A session beer is nice to have around. Keep posting and we'll help you out with the next "happy accident! " Yeah, nothing wrong with doing more session beers. Well this is from my perspective...so you can drink More Beer! Or don't get so snockered so quickly. Sounds like you made is what we call a Session IPA, where I'm from... And the difference between a Session IPA and a lighter, hoppy APA is...not much, in my opinion. A bit more hops in the Session IPA, so call it that. Nice to hear your brewing is going well! Thanks for letting us know. My long term silence does not mean, that I haven't been brewin', I was just too lazy to post here. Sooo, anyway, here's an update, since the last post. 1. I tried my luck with the basic all amarillo APA, but it came out a bit dark because I only had dark crystal malt on hand. My plan with this was to also pitch my next beer, which was going to be some mishmash of my own concoction directly on the yeast cake of this beer. That turned out OK, but when I was going to bottle this, I lifted the fermenter by the lid (idiot), and it fell right off the lid. By pure luck, the fermenter stayed upright, so I was only looking at ~1 L of spilled beer. It was all over my kitchen, as well as the ceiling. The beer was nice, but too dark. I also had to bottle 1.5 L into a PET bottle, because I ran out of bottle caps. 2. on the day of bottling of the beer above, I brewed something which was supposed to be a hoppy light summer ale. This time I went a bit more sparingly with the dark crystal, so the beer was almost completely made out of pale ale malt, with just a hint of dark crystal. I dry hopped this one with a very generous helping of amarillo and aurora hops. Turned out pretty nice indeed. Also has a lovely golden colour. Aside from the fementer mishap, pitching directly onto the yeast cake turned out quite ok. Would do again. 3. this saturday I got a bit bolder with experimentation. Bought some munich malt and threw in a big load of flaked oats to see what the hazy beer thing I see on the internet is all about. I will dry hop this one to oblivion with amarillo and citra as well. 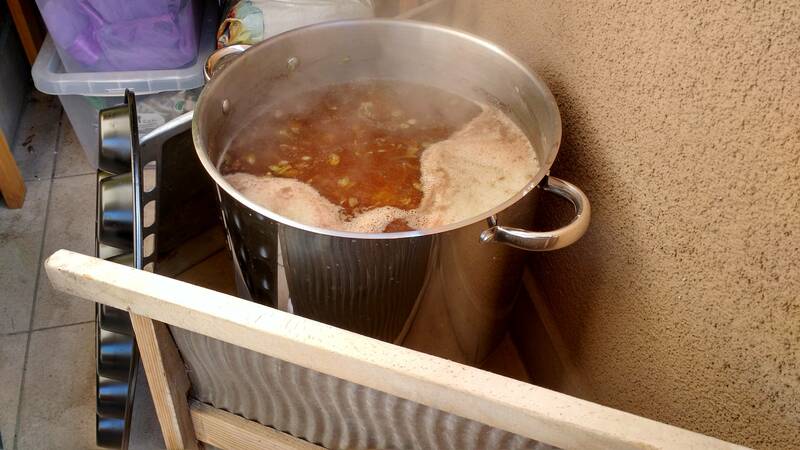 I just threw in the first bunch of hops into the fementer, which is bubbling away happily, now lets see what turns out. I will throw some more hops in beginning of next week and probably bottle around the next weekend. Last edited by bejkee on 29 Aug 2016, 20:53, edited 1 time in total. OK, I've gone ahead and tried this after only conditioning for 1 week in the bottles. Very tasty, although I whish I had put some more bittering hops in there. I feel like the very juicy hoppy aroma could do even better with a bit stronger bitter kick. Otherwise I'm quite pleased with it. Have you had any more brewing advebtures?